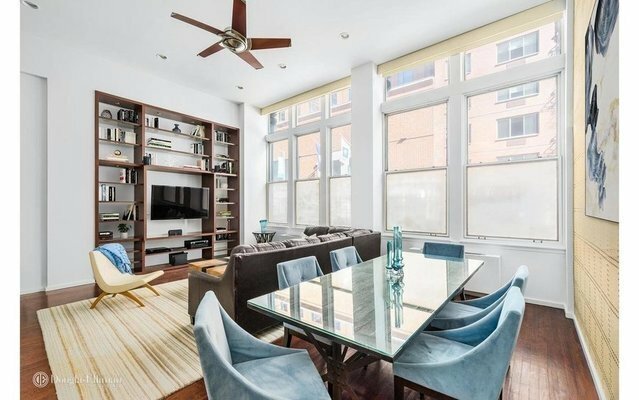 DRAMATIC DOWNTOWN TRIPLEX LOFT...Grand proportions define this 2,148 square foot home, offering potential for both impressive entertaining and elegant comfort. Welcomed into the space by a stately entryway, you're drawn into the oversized living room, characterized by its soaring 13' ceilings and striking wall of 10' windows. The northern light pouring in throughout the day warms the space and invites calm and relaxation. To add to the calm in your life 1H has low monthly carry costs. This expansive 19' x 23' living space begs for entertaining with room for a 12-person dining table and ample space to relax. The western wall of the living room features a handsome floor to ceiling custom built-in to showcase your entertainment system and personal items of interest. The kitchen's design is versatile in that it allows for privacy when cooking, while also welcoming connection with the living space via two accessible entrances. This functional and appealing space is complimented by stainless appliances, a wine fridge, custom cherry cabinets and a natural stone sink. The main floor also features a distinctive half bath, brightened by imported mosaic tile, as well as a convenient entryway closet to store your day-to-day necessities. As you ascend the custom staircase you will find a true master suite, replete with a well-appointed master bath. The sunken whirlpool tub and separate shower define this space as luxurious and relaxing. Contributing to the space's inviting and loft-like character, the bedroom easily accommodates a king-sized bed and offers abundant storage via the 5' x 6' master closet with custom shelving. The downstairs features two large rooms which are currently arranged as bedrooms, as well as a large den and washer/dryer. The spacious, northern-facing bedroom is a peaceful retreat from the city and features generous storage with not only a walk-in closet, but an additional closet behind a custom sliding door. The second bedroom benefits from the convenience and ease of a full en suite bath. The den area is flexible in its potential, perfect for an oversized office space, playroom, or TV area. The Zachary is a sought-after prewar condominium ideally located at the crossroads of the East Village and Greenwich Village. Offering a lifestyle befitting its class, this condominium is nestled amongst the best shops, restaurants and stores in the area, including Whole Foods, Trader Joe's and the Union Square Farmers' Market & everything Union Square has to offer. The location benefits from easy access to major subway lines within a 2-block radius. The building has a 24-hour doorman, and the roof-deck provides additional space to kick back and embrace panoramic views amongst landscaped gardens. *Some images have been virtually staged.